Watching The Amazing Spider-Man 2 at the newly opened 4D cinema at Bonifacio High Street takes the experience to a whole new level. With seats that move up, down, side to side, and around; lights that blaze from above and all sides; gusts of wind synchronized to various scenes in the movie—it will take your breath away. There is no chance of you taking more than a few minutes’ breather and definitely no chance of dozing off. The second installment of this reboot stars Andrew Garfield as the very nimble hero with a huge heart. Emma Stone returns as his girlfriend, Gwen. 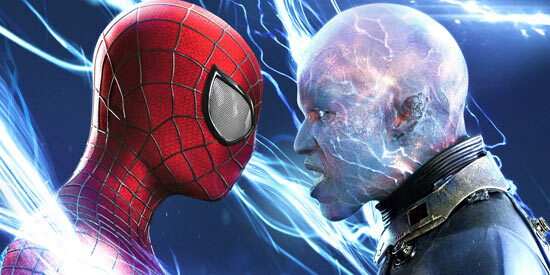 Jamie Foxx as super villain one, Electro, and Dan de Haan as another baddie, Green Goblin. The Amazing Spider-Man 2 certainly has more than enough action scenes, involving New York’s iconic Times Square and power grid, yet, it’s not all hellfire and brimstone, not all flashy play of lights and sounds. During the more calm, quiet moments are scenes of merit—so much so that you learn more about the characters’ motivations. Electro’s alter ego, Max Dillon, is something of an engineering genius—one who does not get recognition, is often neglected and blends with the background. He receives a boost when his life is saved by Spider-man, who even calls him by name. He clings to this glimmer of hope that he matters, acknowledged by someone so beloved, at that. He struggles with his need for affirmation and recognition and when he (like many in this Marvel universe) acquires superpowers after a scientific fluke, he sees it as an opportunity to finally be noticed . And what a debut he makes, with a breathtaking standoff against Spider-man in Times Square as he showcases his ability to manipulate electricity. It is an action sequence but also a pivotal dramatic point in the film. Dan de Haan might be a villain but you can’t help but feel empathy for his character as Harry Osborne. The young Osborne must carry on after his father’s death, burdened by youth, responsibility, and a dangerous secret. His character development from arrogant rich brat to pained lonely billionaire is subtle but, when he finally bursts out as the menacing Green Goblin, all of it just makes sense and falls into place. Andrew Garfield has the most expressive eyes! It’s sometimes easy to forget that he is good-looking, just getting lost in the emotions of those eyes. And his voice and body movements—on which his acting depend when he’s in the Spidey suit, are very convincing. He portrays Spider-man as witty, never losing the playfulness of youth even as he’s grappling with the responsibilities of being an adult and a hero, at that. His scenes as Peter take us deeper into his life as a son, an adopted son, a boyfriend, and a friend. He never lets us forget, though, that despite all of the seemingly normal conflicts in his life and relationships, he has the added burden of being a superhero. Sally Field is already an established actress. But she is exemplary as Aunt May. She makes a supporting role just come alive. She proves that adage that “there are no small roles, only small actors.” She also keeps Spider-man’s heart beating. Emma Stone as Gwen Stacy is a modern-day superhero’s lady. She is smart and capable, and even helps Spider-man during the most crucial action sequence, against two villains, to save New York City. She is sassy and sweet at the same time, and Peter and Gwen light up the screen as sweethearts. Though all of the action sequences are breathtaking and pulse-racing, the one that involves Spidey and Gwen is the one that actually made my heart stop. The script is equal parts action movie and drama, with a smattering of comedy. It is a love story all throughout though: Peter/Spider-man’s love story with his late parents, aunt, girlfriend, friend, and the rest of mankind. It moves the story along, explains many things about the work of Peter’s father, Richard Parker, but also raises more questions. Admission to the 4D cinema in Bonifacio High Street costs P450. A small price to pay for a viewing experience that takes you along for the ride in every action scene. But don’t expect to recline your seat and relax when you watch a movie there. That ain’t gonna happen. Ed's Note: The "PEP Review" section carries the views of individual reviewers and does not necessarily reflect the views of the PEP editorial staff.